to the spells and enchantments of real life. 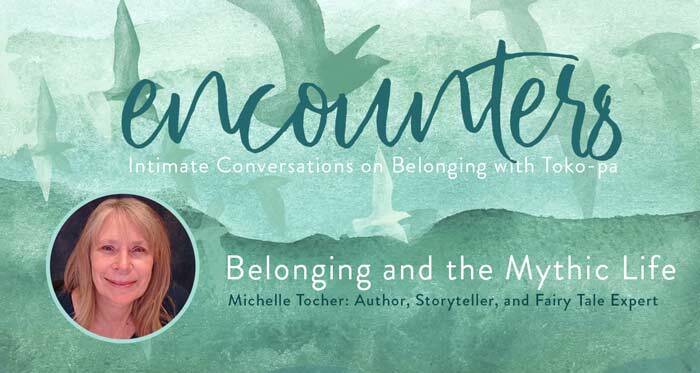 Listen to an intimate conversation with Toko-pa Turner, a gifted dreamworker and author of Belonging: Remembering Ourselves Home. Weaving our way through the story of The Briar Rose, Toko-pa and I discussed the subject of exile and the ‘dark gift’ of suffering and loss. Katie Curtin, who founded the Creativity Café, interviewed me on the healing power of fairy tales. 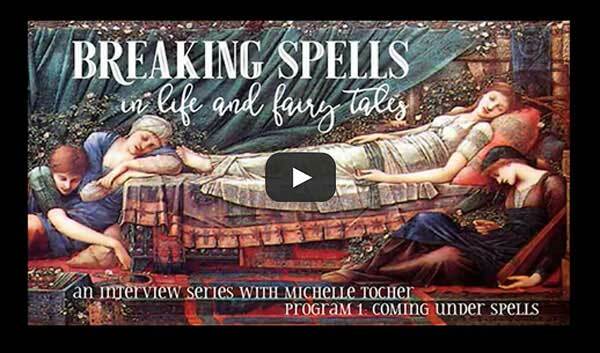 An itroduction to Michelle Tocher and her work with myth and fairy tales. I heard this song in a dream. It was sung by a five-year-old girl from Asia who had learned it from her mother. She had come to North America to live with adoptive parents, but she had not forgotten her mother’s song. When she began to sing in her sweet, bell-like voice, her mother appeared in the background, and she started to sing with her, and then voices poured in from all parts of the world, singing this beautiful song. Michelle talks about the uses of imagination, and compares them to two types of “wands”. How fairy tales can change the way we look at the world, and experience not only human, but non human points of view. How fairy tales can become guides to breaking spells and re-inspiriting life. Michelle briefly relates the classic story Rapunzel to illustrate how the elements of the story speak to our deeper narratives. A glimpse into the role Dame Gothel plays in Rapunzel, and the way that relationship plays out in life. Michelle talks about how the story of Rapunzel changed the way she saw towers in the world. Thank you! You've been added to our blog subscription list and will be notified when new blog posts are created. Sign up to my Newsletter receive notices on my upcoming workshops and events.